Heat oven to 425°F. Line 2 cookie sheets with sides with heavy-duty foil; spray with cooking spray. Sprinkle pepper over chicken. 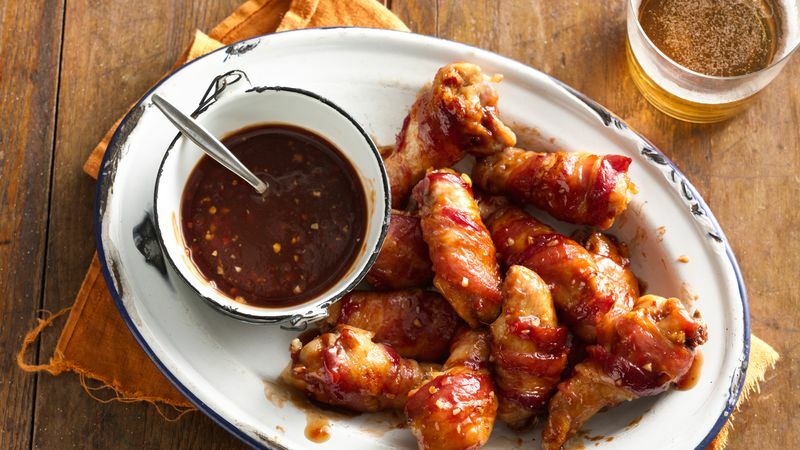 Wrap each chicken piece with a half slice of bacon. Place bacon-wrapped chicken pieces on cookie sheets, bacon end down. Bake uncovered 30 minutes; turn chicken; rotate cookie sheets in oven. Bake 20 to 30 minutes longer or until golden brown and juice of chicken is clear when thickest part is cut to bone (at least 165°F). Meanwhile, in 1-quart saucepan, mix Bourbon Sauce ingredients; heat to simmering over medium heat, stirring frequently, until sugar is dissolved, about 5 minutes. Remove from heat; set aside. In large bowl, toss chicken with half of the sauce. Serve warm with remaining sauce on the side for dipping.